The software defined datacenter is here to stay, and when it comes to virtualization, VMware certification is the undisputed gold standard in virtualization certifications. With more rich features, extremely reliable, scalability, VMware serves as the backbone of corporate virtual infrastructures for most of you out there. However, becoming proficient on VMware can be a challenge, and achieving VMware certification can be like walking through a mine field. So before you spend a dime on VMware Training from somewhere else, here are few things you need to know. Step 1: To certify or not to certify? This is the most important question you need to ask yourself. 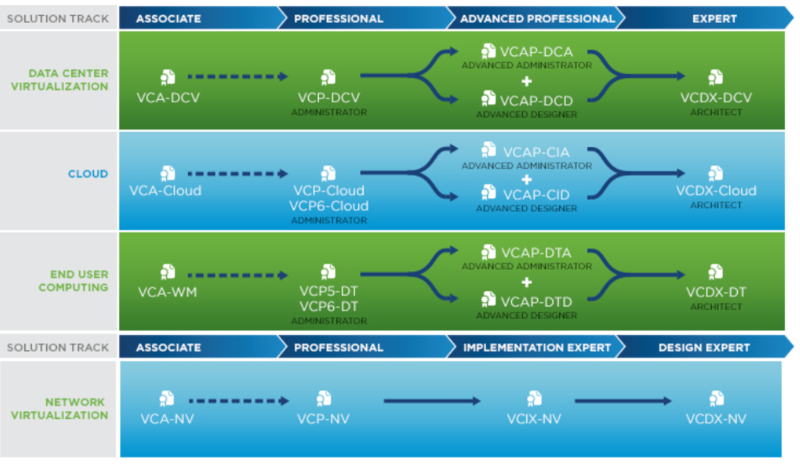 While there are a couple of certifications floating around out there on VMware, the VMware Certified Professional (VCP) is the industry recognized certification for VMware Technologies. As such, we highly recommend anyone who has a goal to achieve VMware certification to pursue this one. However, there are few things you need to know before signing up for any VMware Certification training. First, unlike other certifications where all you have to do is pass an exam, VMware requires students to pass an exam AND take a VMware Authorized course before they will certify you. If VMware certification is the goal, make sure the training you register for meets VMware’s requirements. Step 2: Live Classroom Training or Live Online Training? The second question you need to ask yourself is how do you learn best? For some people getting out of the office and into a live classroom with the instructor is the way to go for them. For others, taking a live class online works better due to their proximity to the training center, and because they live busy lives. The good news is we can do both. Just let us know what you prefer and we will make every effort to accommodate you. The most popular authorized course is the VMware vSphere 5.5 or 6.0 Install, Configure, Manage course. What you need to know, however, is while this course satisfies the authorized requirement for VMware Certification, it only covers around 60% of the VMware certification exam blue print. Make sure that if you do take this course, it comes with a test preparation package. Without it, the failure rate on this exam is around 80%. Yes, you read that right. Only 20% of students who take the authorized class and then sit the exam, pass on the first time and become VMware certified. If VMware certification is NOT a primary goal, but knowing VMware vSphere inside and out is, then consider enrolling in the VMware vSphere Professional Boot Camp. This proprietary 5 day intensive class is for System Administrators who really want to know VMware top to bottom. The course covers the ENTIRE VCP blueprint, and then some. Each student will start from scratch, install ESXi and move through step-by-step lab modules designed to maximize knowledge transfer, highlight best practices and instill the real world skills needed to efficiently manage, deploy, and administer VMware’s vSphere infrastructure in an enterprise production environment. This Boot Camp also come with a 30 day test prep package with over 1000 questions and learning points to help reinforce topics that are covered in class and instill confidence in their ability to manage a VMware software defined datacenter. Option 3: I want to master VMware vSphere & Achieve VMware Certification! There is a program for those who have little to no experience on VMware vSphere, and that is our VMware Certified Professional Boot Camp. This option combines both options above into two 5 day courses, includes 60 days of the online VCP exam preparation platform, additional lab time if needed, and one-on-one access to the instructor to help prepare you for the exam. If you want to do it right, then this is the way to go. Yes it is a bigger commitment, but this path gives the student the highest probability of passing the VCP5-DCV exam. Students will sit the VMware vSphere Boot Camp first, where you will work intimately with an expert on VMware to learn the technology from the ground up. At the conclusion of the live course, students will begin online test preparation and be tracked by our instructor on their progress and being able to answer question similar to what they will find on the VCP-DCV exam. Next students will sit the Authorized VMware Install, Configure, Manage course in preparation for taking the VMware certification exam. Once completed, student will have been drilled on the blueprint, what to expect on the exam, and be ready to administer VMware virtual infrastructures in the real world.